If targeting redfish on the flats is in your target list itinerary, then Tampa Bay is a dream come true. Tampa Bay is home to a thriving redfish population that includes everything from “rat red’s” to bulls. One of the best aspect about redfish here in Tampa is the fact that no matter the time of year, these drag pulling bottom feeders are readily available all year long. Cold or warm water, a red is there waiting to attack. On nearly any outing, finding a “keeper” red or more specifically, a red within FWC set slot limits, is a regular occurrence. Targeting redfish will boil down to matching seasonal prey and presentation. 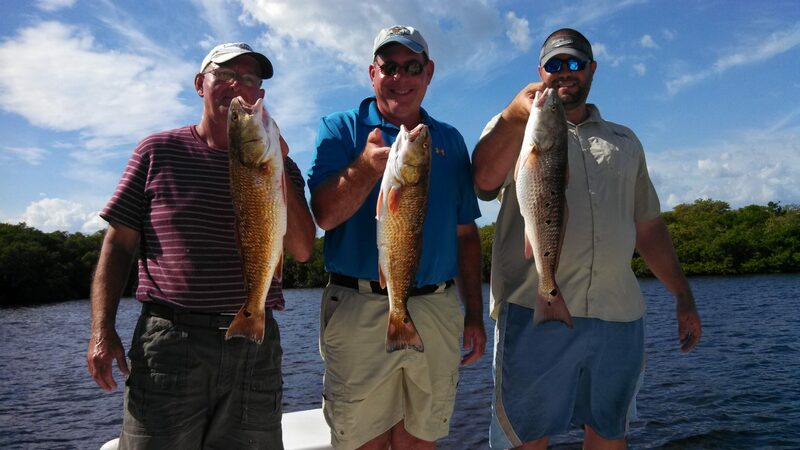 Redfish are very sought after species in Tampa FL and also many other parts of the state. Redfish are known for strong fights and sight fishing capabilities. Reds tend to school up on the flats by the hundreds and make for some great light tackle action when fishing the flats of Tampa Bay. You can target and catch Redfish year round in Tampa Bay with the prime months running in spring and fall. Sizes range from 15 to 45 inches and average size ranging 25 inches. Redfish are known to be a very spooky fish so may use trolling motors and even push pole when edges towards schools of fish. Both live and artificial baits work great for Redfish. Redfish also make for a great table fair. Blackened Redfish is a household favorite. Slot limits for the Tampa, FL are 18 to 27 inches with a bag limit of 1 per person. This changes depending on your location. Redfish have a downward nose and use this to dig up crustaceans as a favorite meal. Shrimp and Crabs are a few favorites when targeting redfish.